Sometimes you don’t know what you don’t know – this is why a Customer Journey Map (CJM) is an essential tool for every business. A CJM illustrates the journey that your customers go through while interacting with your company – whether it be buying a product, employing your services or engaging in online experiences. You can choose to have your CJM detail the entire life cycle of engagement (“cradle to grave”) or examine a micro view, such as looking at each customer segment or a specific customer-company interaction. A CJM isn’t a niche-specific practice either. From library sciences to medical practices, a CJM can benefit any business, in any field. Customer Journey Mapping can uncover small bumps in the Customer Experience or it can lead to eye-opening revelations of areas needing major improvement. For example, you can’t predict that 20% of a customer base will veer away from a business as soon as they read a poorly-worded product description, or that 30% will never do business with a company again because of the lackluster experience of unboxing a product. All you see is a declining revenue graph. With a carefully constructed CJM, your company can pinpoint, detail, and solve problems within customer engagements that lead to failed journeys. An effective CJM is vital to the health of a business in identifying and preventing failed customer journeys. The key component to creating a valid CJM is data. That’s where process mining comes in. Process mining is a process management technique that allows you to learn about your customer’s journey by examining various types of analytical data. Data sources are countless and can include social media, online activity, your company’s database, surveys and third party sources. These sources allow you to examine differing types of data to learn about your customer’s journey. Whether this information is transactional, psychographic, demographic, behavioral or relationship, the data helps you construct your customer’s typical journey. Anecdotal data, paired with analytical data, can help piece together the entire journey. Broad ethnographic-style customer and front-line staff interviews and social media commentary can help shed light on various opinions and behaviors – which are invaluable ways to validate your hypothesis. How deep can a CJM go? The end result of gathering and analyzing this important customer data is the ability for your management team to see the customer through a “visual journey.” With this data, a clear and concise infographic can be developed so that all stakeholders can visualize each step of the Customer Experience. The visual brings to light negative customer experiences that serve as significant barriers in the purchase process. The infographic below shows the Customer Experience on a travel booking website, where one can clearly see areas of dissatisfaction in the overall appearance of the website, itinerary and cancellation process – but it doesn't end there. Additional CJMs can then be developed for these areas to further address issues with dissatisfaction. Be careful not to ignore areas of satisfaction as well as they are also a great source of customer understanding. Whether identifying a pain point or success in your customer journey, CJM's will help you be proactive in making Customer Experience improvements and staying ahead in your ever-changing marketplace. The opportunities to improve your Customer Experience and profitability are endless. A Customer Journey Map that combines data processing along with anecdotal and analytical research can uncover a plethora of red flags in your organization. This information can lead to a massive movement of reconstructive changes within your business. There are often stark changes before and after effective CJM reports. For example, you may find that even though your sales figures are high, the hidden truth is you’re losing 26% of your customers at the checkout because of a faulty payment system. The evidence speaks for itself … more than 60% of businesses are beginning to invest in CJM initiatives as the necessity to retain and grow customers becomes even more critical in a market saturated with competition. For companies that want to maintain or gain market share in a highly competitive atmosphere, this isn’t a tool that would be “nice to have” – it’s critical. Contact PPT Solutions today to learn more about how we can help. 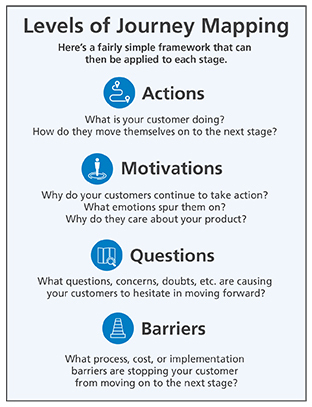 "Journey mapping is critical to remaining connected to your customer. It allows organizations to better align on operational enhancements that reflect the reality of customer decision making. It's the driving force behind every customer-centric company and is transformational in providing better experiences and generating greater loyalty."